A Dharma teacher is a continuation of the Buddha and of all our ancestral teachers. Their deepest aspiration is to manifest mindfulness, concentration, and insight in every thought, word, and action. Guided and protected by wisdom and compassion, a Dharma teacher is a happy person who joyfully passes on the practice to others. A Dharma teacher in the Plum Village tradition conducts one’s life in accord with the Five and Fourteen Mindfulness Trainings. Is guided by bodhichitta, looks deeply, and sees and nourishes the bodhicitta in others. These teachers have the support of their sangha, fellow Dharma teachers, and their family. Our Teacher, Thich Nhat Hanh, has shared about being a dharma teacher in this talk from 2001. “There are Dharma centres, there are monasteries, there are teachers, there are Dharma brothers and sisters who practice and being a member of the Order of Interbeing helps us to profit from all of these in order to advance on our path of freedom. With enough freedom we can make others around us happy. We know that practicing without a Sangha is difficult so we try our best to set up a Sangha around us, where we live. To be an OI member is wonderful . To be a Dharma teacher is wonderful. Wonderful, not because we have the title of OI membership, or of Dharma teacher, but because we have the chance to practice and to organize. “Being a Dharma teacher is also an opportunity to practice – you cannot not practice! You need to practice in order that your teaching has content. How can you open your mouth and give the teaching if you don’t do it yourself? The teaching is an opportunity: even if you are not an excellent teacher yet, being a Dharma teacher helps very much when you speak about the Dharma, for you have to do what you are sharing, otherwise it looks odd. It’s like a monk living with other monks: when everyone is doing walking meditation it would look strange if that monk did not do the practice. So, as a Dharma teacher, you have a great opportunity to practice. On June 14 and June 15, 2018 the sangha invited twenty-six Order members to receive the lamp transmission. 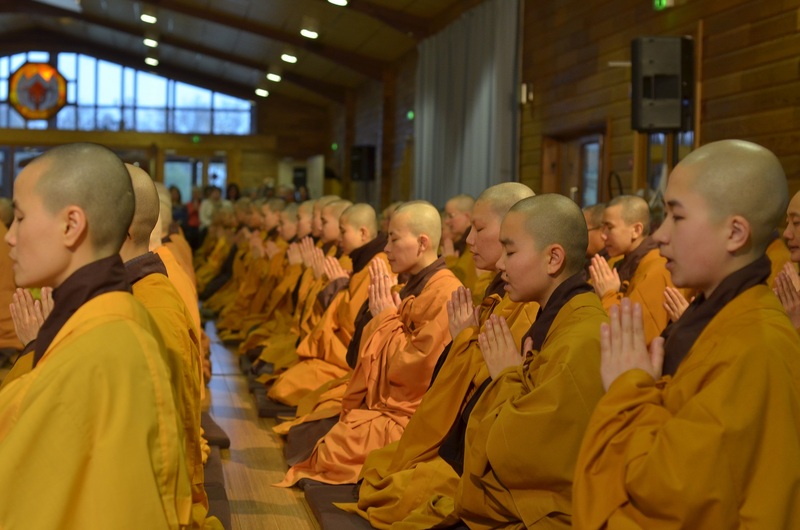 The ceremony took place at Plum Village, France and included the following people surrounded by hundreds of lay and monastic practitioners. We welcome these dear friends to the community of teachers. As many of you may know, since 2012 Ven. Thich Nhat Hanh has been consistent in his defense of the well-being of the Rohingya people, who are Muslim, against discrimination and violence in an overwhelmingly Buddhist country, Myanmar. Since last fall, over 647,000 impoverished Rohingya refugees …. that’s correct, over 647,000 in the course of only a few months…. have fled across the border into one of the most poor regions of neighboring Bangladesh, historically a country in great need itself. In an effort to mitigate the suffering of Rohingya refugees fleeing from Myanmar into nearby Bangladesh, we are writing to enlist your help in our capacity as the Care-Taking Council of the Dharma Teachers ordained by Ven. Thich Nhat Hanh residing in North America. Since 2012, Ven. Thich Nhat Hanh and our Council has been writing to lay and monastic leaders of Myanmar, asking them to look deeply in order to see and understand the basic humanity and rights of the Rohingya ethnic minority living in western Myanmar, who practice a form of Islam. We and other Buddhist leaders wrote to the government of Myanmar in February of this year as well to ask that its military cease military operations against Rohingya refugees causing them to flee Myanmar into impoverished Bangladesh. 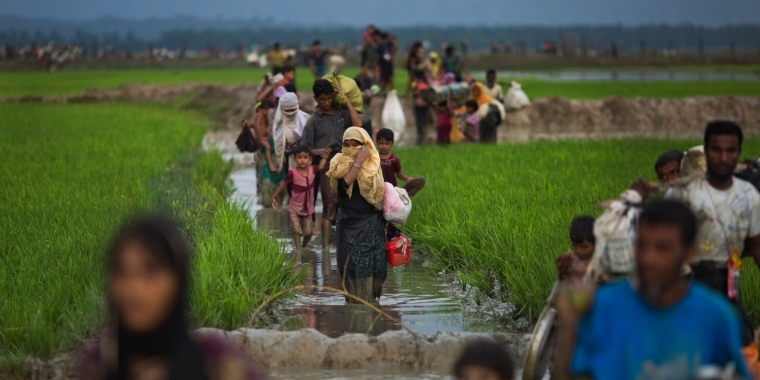 As you have probably learned from newspaper sources, notwithstanding its receipt of many such letters appealing for peace, Myanmar military operations increased sharply this summer, causing an estimated 500,000 Rohingya refugees to flee into one of the most remote and poverty-stricken areas in Bangladesh within a period of approximately 30 days, sometimes at the rate of 20,000 people each day, only to hide in forested hillsides. The following letter was written by Robb Kushner, an Order of Interbeing Aspirant. Robb has given permission to post and share this very instructive and thoughtful statement. The tragic events in Charlottesville this past week have caused me to revisit a powerful idea: a National Resolution of Atonement – and I want to share this with you in the hopes that you may want to bring it up in Congress. It is time for our country to officially atone for the twin atrocities of centuries of unconscionable subjugation of Native Americans – including stealing their lands – along with the tragic enslavement with ensuing subjugation of African Americans. The Germans have atoned for their perpetration of The Holocaust. We as a nation desperately need to face up to these tragic elements of our past. We are truly a nation of immigrants, and this has always been our key strength and point of uniqueness. We need to celebrate the diversity across our land that makes us such a blessed country. In addition, by adopting this kind of national atonement, we will send a clear and unequivocal message that racism and bigotry will never be tolerated – in any manner – in our national dialogue, including public displays and assemblies. I trust that you will give this idea the kind of serious consideration it deserves. And I hope to hear your thoughts in response. In addition to the letter, the following practice statement from ARISE (Awakening through Race, Intersectionality, and Social Equity) is very relevant to this topic. GATHA FOR HEALING RACIAL, SYSTEMIC, AND SOCIAL INEQUITY: Aware of the suffering caused by racial, systemic, and social inequities, we commit ourselves, individually and as a community, to understanding the roots of these inequities, and to transforming this suffering into compassion, understanding and love in action. As a global community of practitioners, we are aware of the disproportionate racial violence and oppression committed by institutions and by individuals, whether consciously or unconsciously, against African Americans and people of color across the United States and beyond. We know that by looking deeply as individuals and as a community, we can engage the collective wisdom and energy of the Sangha to be our foundation for Right Thought, Right Speech, Right Action, Right Mindfulness, and Right Insight. These are the practices leading to nondiscrimination, non-harming, and non-self which heal ourselves and the world. We write to share a happiness that in 2018, Plum Village will be hosting their bi-annual 21 Day Retreat from June 1-21. 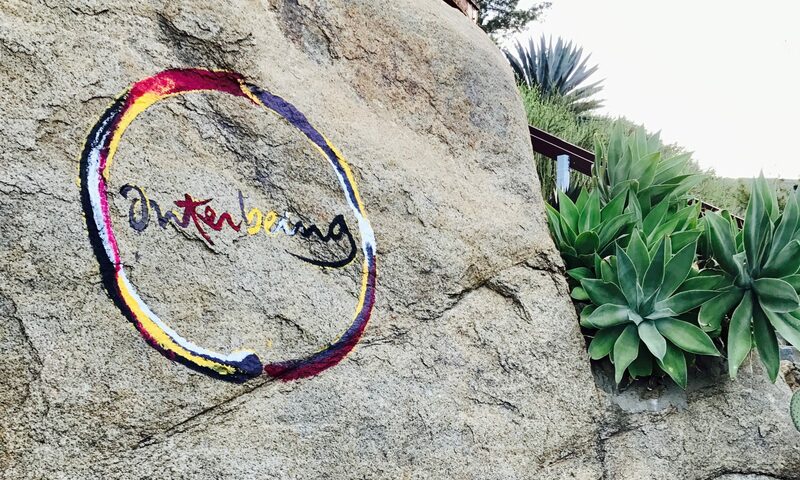 It is a retreat focused for experienced Buddhist practitioners, especially from our Order of Interbeing community, but is also open to the general public. The retreat will be conducted in English with respective translations. We will also be transmitting the Fourteen Mindfulness Trainings of the Order for all qualified international OI aspirants. Please save the date! and read the letter of invitation, in English, French and Spanish. Once registration opens, we will arrange for the first month to be open only for members of the Order and then open up for the general public, so keep an eye out for the open-registration date on the Plum Village website. In 2017 there will be three opportunities for aspirants from North America to be ordained into the Order of Interbeing. In order to facilitate the process, the Care-Taking Council of the Dharma Teachers Sangha of North America (including both monastics and lay Dharma Teachers) have clarified the requirements, criteria, and procedures for North American students of Thich Nhat Hanh. The Fourteen Mindfulness Trainings offer clear guidance for living simply, compassionately, and joyfully in our modern world. They are a concrete embodiment of the teachings of the Buddha and the Bodhisattva ideal. Anyone who wishes can live his or her life in accord with these fourteen trainings. To formally join the Order of Interbeing means to publicly commit oneself to studying, practicing, and observing the trainings and, also, to participating actively in a community which practices mindfulness in the Plum Village tradition of Thich Nhat Hanh. From time to time, Order of Interbeing (OI) Core Community members may fall away from their practice as brothers and sisters in the OI family. Some of these friends retain or rediscover their heart’s connection to the Order of Interbeing core community and practice, but finding a way back into practice with the OI community may be challenging for the practitioner and confusing for the local Sangha that was “left behind.” The Order of Interbeing Charter encourages OI members to develop appropriateness and skillful means, leading “to a capacity to be creative and to reconcile.” The North American Dharma Teachers Sangha offers this “road back” as a means to support local Sanghas and lapsed core community members who wish to renew their commitment to Plum Village practice and the OI core community. We hope it will help lapsed OI core community members reconcile with and rejoin their local Sanghas, reconnect with the Fourteen Mindfulness Trainings and the OI core community, and renew their commitment to practicing as an Order of Interbeing core community member. 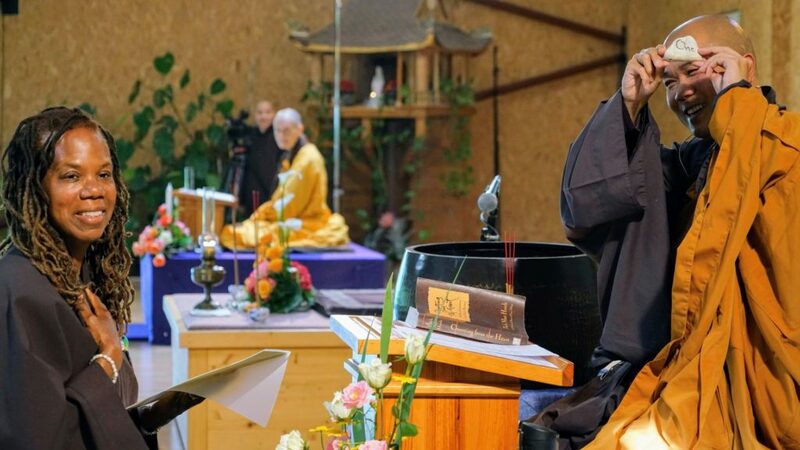 The Forty Tenets were formulated and taught by Thầy in Plum Village during the Spring Retreat 2006, the Autumn Retreat 2006 and the Winter Retreats 2006, 2007. They serve as the foundation for the Plum Village teachings and practices and for our Mindfulness Trainings, whether they are the Five of the laity, the Ten of the novitiate, the Fourteen of the Order, or the several hundred of the monastics. In the early 90’s, Thầy taught many courses about the history of Buddhist thought in a number of winter retreats, including “The Living Tradition of Meditation Practice,” “The Sutras of the Southern Transmission,” “The Sutras of the Northern Transmission” and in 2005, “The Wheel of the Different Schools Commentary” which discusses the different tenets held by the more than twenty early different Buddhist schools. These teachings give us an overview of the history of Buddhist thought. These tenets are Thầy’s attempt to identify and define the teachings that we maintain, learn and transmit in Plum Village and capture our relationship to the various paths in the history of Buddhism. They are the result of Thầy and the Plum Village community’s study and practice of Buddhist teachings and methods, and deep looking into the evolution of the various Buddhist schools and their teachings. During this 21 Day Retreat 2016, we will have a chance to reexamine some of the theses that Thầy has put forward; explore how they can inform our practice and how they can be a foundation for applying the Trainings of the Order of Interbeing as we actively engage with society. As practitioners, we invite you to read these theses of Plum Village with a critical, scientific attitude that is based on your own experience of the practice. Space is not an unconditioned dharma. It manifests together with time, matter and consciousness. In the historical dimension, every dharma is a conditioned dharma. In the ultimate dimension, every dharma is an unconditioned dharma. Nirvāṇa is nirvāṇa. There does not need to be a nirvana with residue (sopādiśeṣa) or without residue (anupādiśeṣa). It is possible to touch Nirvāṇa in the present moment. Nirvāṇa is not a phenomenon, but the true nature of all phenomena. Not born means nirvāṇa and it is awakening to the truth of the deathless, the no-coming and no-going, the not the same and not different, the not being and not non-being. The concentrations on empitness, signlessness and aimlessness help us to touch Nirvāṇa and the Unconditioned. The Three Dharma Seals are: impermanence, non-self and Nirvāṇa. We can uphold Four Dharma Seals or Five Dharma Seals with one condition: that they include Nirvāṇa. The basic concentrations (samādhi) are the concentrations on impermanence, no-self, and Nirvāṇa. Mindfulness, concentration and insight are the essential practices that give rise to liberation. Precepts are mindfulness. (Śīla is smṛti). Precepts and mindful manners are concrete expressions of mindfulness. Right diligence is mindfulness trainings (morality, Śīla) and therefore is also mindfulness. Mindfulness, concentration and insight include each other. All three have the capacity to bring joy, happiness and liberation. The awareness of suffering helps us recognize the existing conditions of happiness and also helps prevent the creation of wrong actions and the planting of negative seeds that will bring about suffering. The Four Noble Truths are all conditioned. The Four Noble Truths are all unconditioned. The Third Noble Truth can be called the truth of happiness. Free will is possible thanks to the Three Trainings. You should learn to see the Second Noble Truth as the path of the eight wrong practices. The deep cause of ill-being is not just desire. A real Arahat is also a Bodhisattva and a real Bodhisattva is also an Arahat. As a human being you have the capacity to become a Buddha. As a Buddha you continue to be a human being. That is why numerous Buddhas are possible. The Buddha has many bodies: the body of a living being, the Dharmabody, the body outside of the body, the Sanghabody, the continuation body, the Dharma-realm body, and the true nature of the Dharma-realm body. Since human beings can become Buddha they also have all these bodies. We can talk of a person as a continuous and ever-changing stream of five aggregates. This stream is always flowing. It is in connection with, receives from and contributes to other streams of phenomena. We cannot speak of a person as an unchanging and permanent separate self. We can only understand the real teaching of rebirth (samsāra) in the light of impermanence, no-self and interbeing. Happiness and suffering inter-are. Affliction and enlightenment are both of an organic nature. The Sangha body, the Buddha body and the Dharma body inter-are. In a true Sangha you can find the true Buddha and the true Dharma. Since the afflictions (kleśāh) and the awakening (Bodhi) are of an organic nature, the practice needs to be constant in order for transformation to continue and for regression not to take place. Samsāra is a continuation and the beautiful and wholesome things need to be continued for as long as possible, while the not beautiful and unwholesome need to be transformed so that they do not continue. The compost has to be used to nourish the flowers. Liberation from samsāra does not mean putting an end to the personal self (pudgala), because that person is not a real entity anyway, nor does it mean putting an end to the precepts’ body and the spiritual life. Birth and death are only manifestation or non-manifestation. Both manifestor and manifested occur at the same time, the manifestation of one thing is the non-manifestation of something else. A dharma is not a thing, an entity, but a process, an event and above all an object of mind. Retribution consists of both body-mind and environment, and is both individual and collective. This land is the Saha land for living beings but Pure Land for Buddhas and Bodhisattvas. There is no self but still there is the cycle of birth and death, there is inter-continuation and the nature of all inter-continuation is interbeing. Each generation of Buddhist practitioners has to resist the human tendency and need on the one hand to make the Buddha divine and on the other hand to try to find a principle to take the place of a self. Store consciousness has the capacity of learning, storing, protecting, responding, nourishing, healing and continuing. Its function is to establish a database and unconscious habits of responding to situations, which makes it possible for a human being to act on ‘auto-pilot’. Manas has the tendency to seek for security and long lasting pleasure. It is ignorant of the law of moderation, the danger of pleasure seeking and the goodness of suffering. It does not see the necessity for insight into impermanence, non-self, inter-being, compassion and communication. With the practice of mindfulness, concentration and insight, mind consciousness can learn and download its insights to Store consciousness and leave Store consciousness to do the work of maturation and then manifest the seeds of wisdom that are already innate in Store consciousness. The basic practice of Source Buddhism is the Four Domains of Mindfulness which has the function to recognize and transform the habit energies and fully realize the Seven Factors of Enlightenment and the Noble Eightfold Path. The Mahāyāna practice of meditation including the Zen of the patriarchs needs from time to time to go back to take a bath in Source Buddhism in order not to lose the essential Teachings of Buddhadharma. The reality of the Pure Land or Nirvāna transcends both space and time. The reality of everything else is exactly the same. Conditions, feelings, skandhas, āyatanas, dhātus, vijñāna, etc. are different ways of presenting the teachings. These different ways of presenting the teachings are not in opposition to each other. The teachings on impermanence, non-self, interdependence, emptiness, signlessness, aimlessness, mindfulness, concentration, insight, etc. constitute the heart of the Buddhist wisdom. They can go together with the spirit of science, they can be used in dialogue with science and offer suggestions and be a support for scientific research. Modern science should try to overcome the tendency of double grasping and scientists should train themselves to develop their capacity for intuition. In 2015 there will be three opportunities for aspirants from North America to be ordained into the Order of Interbeing. In order to facilitate the process, the Care-taking Council of the Dharma Teachers Sangha of North America (including both monastics and lay) have clarified the requirements, criteria, and procedures for North American students of Thich Nhat Hanh.